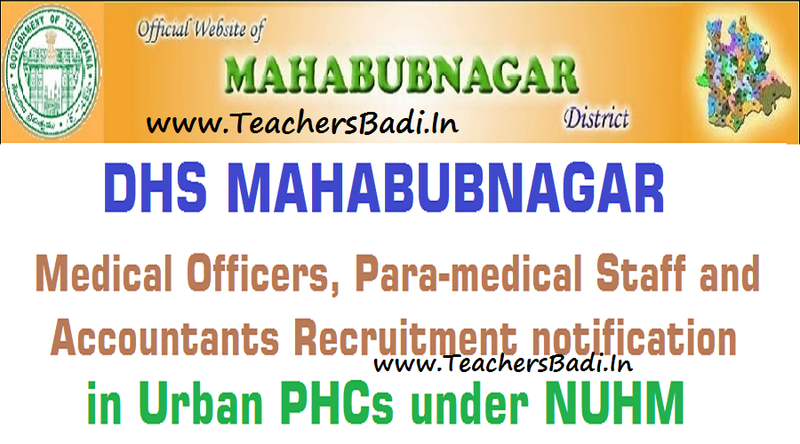 Mahabubnagar Medical Officer,Staff Nurse,Pharmacist,Lab Technician,Accountant,ANM Posts Recruitment/National Urban Health Mission Medical, Paramedical & Accountant recruitment/ Recruitment of Medical Offiers, Para-medical Staff & Accountants in Urban PHCs under NUHM: DHS Mahabubnagar UPHC Certain Posts 2016 Recruitment notification under NUHM: Government of Telangana, District Health Society, Mahabubnagar district has published the Medical Officer-Staff Nurse-Pharmacist-Lab-Technician-Accountant-ANM Posts recruitment notification and applications are invited from eligible candidates in the prescribed “Application Form” for recruitment of certain posts on contract basis under National Urban Health Mission. The contract is initially for a period of one Year and renewal will be as per the need and NHM yearly plan (PIP) and also subject to satisfactory performance. However, every year new contract has to be signed and valid for the period as indicated in the contract. ii. For ex-service men 3 (three) years in addition to the length of service in armed forces. iii. Disabled persons 10 (ten) years. Qualification: SSC, GNM, Inter, DMLT, B.Com, B.Sc (Nursing), MBBS, D.Pharmacy. B) 18 months MPHW (F) Training Certificate recognized by AP/TS Nursing and Midwives Council OR Two years Intermediate Vocational MPHW (F) Course and have completed one year clinical training in selected Government hospital in which these students have been permitted to undergo clinical training (OR) completed one year Apprenticeship Training in identified hospitals and awarded “Apprenticeship Completion Certificate” by the Board of Apprenticeship training GOI, Southern Region, Chennai. 1. Recruitment shall be made by the District Selection Committee for the District Health Society. a. Total Marks are 100 of which 90 marks will be allotted basing on the marks obtained in qualifying examination and 10 marks will be awarded for the age. b. Merit list will be prepared based on the marks obtained with above criteria and displayed on website for transparency and also for calling objections. c. Selection list will be prepared from the finalized merit list duly following the rule of reservations and presidential order. The Format of Applications may be downloaded from the District Official website after filled it may be submitted in person or by Registered post to O/o the Dist. Medical & Health Officer, Mahabubnagar. The date of receiving applications commences from 06/05/2016 at 10.30AM, and ends on 18/05/2016 by 5.00 P.M. The Selection committee is not responsible for any postal delays. a. Application forms along with the instructions can be downloaded from official website www.Mahabubnagar.nic.in. b. Filled in application form shall be submitted in person or through registered post to O/o the District Medical & Health Officer, Mahabubnagar. Applications which are received after due dates will be summarily rejected. District Selection Committee is not responsible for postal delays. c. A person can apply for more than one district. d. Self-attested copies of the following certificates should be enclosed along with the Application form should be orderly. Last date for submission of applications: 18.05.2016.